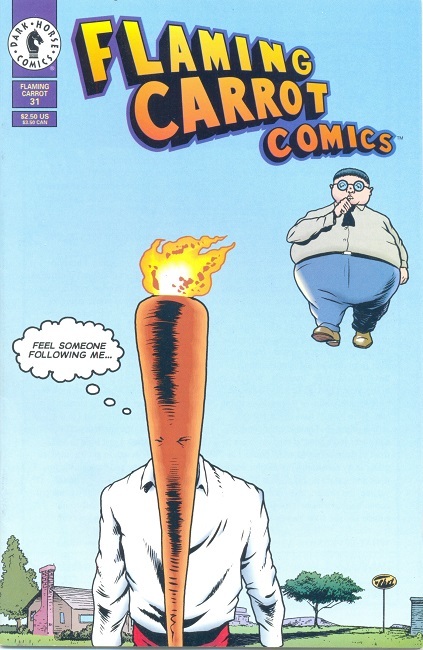 Back Issue of the Week: Flaming Carrot Comics #31 (October 1994). A team-up for the ages! The Flaming Carrot, the oddball surreal superhero, joining forces with Herbie Popnecker, the star of an equally-strange comic book series from the 1960s! If I recall correctly, Carrot creator Bob Burden had actually sought out Herbie’s creator, Ogden Whitney, for an artistic collaboration but Mr. Whitney had unfortunately passed away in the 1970s. Burden is more than up to the task of presenting the inherent weirdness of Herbie, however. FUN MIKE FACT: the Flaming Carrot’s secret identity is a long-standing mystery, and I was half-convinced that the Flaming Carrot was, in fact, a grown-up Herbie. One would think this particular issue would have put that theory to rest, but frankly, given the sorts of adventures both characters were involved in, that still isn’t a deal-breaker! This entry was posted in Back Issue of the Week on November 18, 2016 by Mike.